Create a geographic analysis of a wireless network. Avoid major risks by performing what-if analyses. Evaluate expansion prospects and find hidden opportunities. Assemble and analyze data in minutes instead of days. Analyze networks geographically to find inefficiencies Keeping a complex network running at full capacity requires a lot of data-- in real time. With a typical network generating terabytes of usage and performance data, creating a meaningful telecommunications analysis in a reasonable time frame can be nearly impossible. Tableau Desktop allows even casual users to connect to massive databases and quickly create dashboards that identify relevant information. Load data into the Data Engine when you need to work with massive data at interactive speed. Share findings with decision makers through Tableau Server. This broadband network was analyzed to evaluate future expansion sites and current performance. By clicking on a portion of the bar chart on the left, relevant site information is immediately displayed in the map and the detailed list below. Instead of creating hundreds of individual reports by site, the entire network can be evaluated in real time in one compact and powerful telecommunications analysis dashboard. Evaluate expansion prospects and find hidden opportunities Finding new customers is a struggle for every business and a crucial part of any telecommunications company's analysis initiatives. Deploying new network infrastructure to access completely new markets can be enormously expensive. 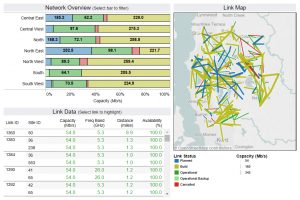 With Tableau, analyzing networks for expansion opportunities, whether existing or new, is as easy as dragging and dropping. 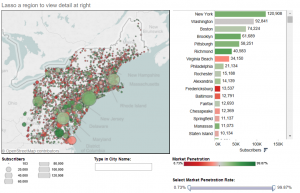 This view allows users to filter cities by their market penetration. In the search for new customers, one might grab the right side of the “Market Penetration Rate” filter to view only those markets with less than 50% penetration. Similarly, individual city queries can be easily achieved using the city name filter in the bottom right hand corner. Instead of struggling with endless spreadsheets and market data, Tableau allows you to present large amounts of data together and analyze it efficiently. Easily create network visualizations to achieve this integral first step.